These 21st Century latin revolutionaries will also be promoting their EP (see below for details). 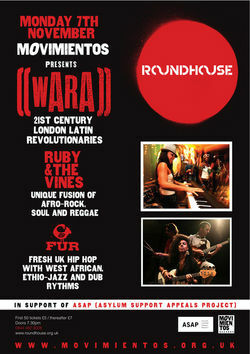 Wara will be supported by Ruby and the Vines (a unique fusion of afro-rock, soul and reggae) and also Fur (UK hip-hop with West African, Ethio-Jazz and Dub rhythms). Wara are a hot melting pot of identities, living in London with backgrounds from all over the world: Cuba, Argentina, Venezuela, Chile, Ghana, Congo, Spain and the UK. They’ve concocted a musical genre of their own with strong Cuban roots. Taking influences from Timba, Afro Cuban styles and the new Cuban funk-fusion bands, as well as other Latin and African rhythms and fusing them with a distinct London sensibility. With contagious, in-your-face vocals from Congolese-Argentinean lead Juanita Euka (niece of legendary Congolese musician Franco), inspired keyboard flourishes from MD Eliane Correa, MC Murmur quick on the rhymes and a super tight Latino / UK mix on the rhythm section - their musical energy is palpable.